This review for OptiMind will help you make a better decisions regarding the nootropic supplements you decide to take. The company claims that this product has the ability to give you longer periods of time with focus and the ability to wake up effortlessly every single day. They also claim that it has the ability to provide mental focus without taking away from your creativity. Discover more about the benefits of this supplement listed below. According to the manufacturer’s website you are supposed to take 2 capsules per serving. It is advised that you start with one tablet so you can see it affects you and your body. It is also advised that you experiment with the amount of capsules that you take daily you until you find the right combination for you. There are a variety of different options available to purchase in regards to this supplement. They offer a free 14-day trial that also includes free shipping. You can purchase one bottle a month for $43.41 or a double bottle for $63.95. You can cancel your auto-shipments at any given time. All of these packages include free shipping. When I tried the 14 day free trial of this product I found that it kept me focused on my work throughout the day and I was able to concentrate on my school work even in the evening time. Most of the customer reviews state they have experienced similar results and continued to use the product after the trial. People begin to see results after the first 45 minutes after the first dose is taken. Many people experience increased concentration in 30 minutes. Long-term effects begin kicking in within the first week. The manufacturer offers a 14-day free trial with a 100% money back guarantee as well as free shipping. 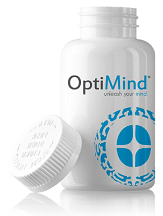 OptiMind seems to be an effective product in terms of helping with boosting concentration and energy levels without the jitters that come with coffee or energy drinks. They offer a 14-day free trial which is a plus for people who like to try it before they buy it. After the 14-day trial, the price of $43.41 a month is a bit more expensive than the other supplements in the same niche. While no one reported any side effects, this supplement does contain caffeine which some people have a sensitivity to.